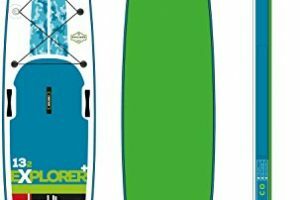 The Vilano Voyager is a great board for beginners and intermediate paddlers who love to spend their days paddling for fun. It is made of the highest grade PVC which is reinforced with Korean dropstitch reinforcement for the optimum durability. The touring style is crafted for speedy long-distance paddling over flat water. It is built with portable features that allow you to bring it anywhere for your next water adventure. This model allows you to bring your camera or cooler while riding it. 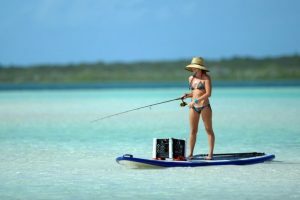 Through the heavy duty D ring hooks and bungee features, you can bring items along while you enjoy long-distance paddling. This helps you survive long hours of riding with so much ease. 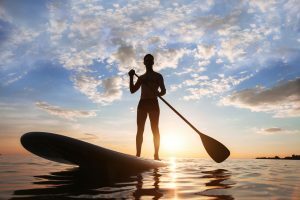 You can carry this paddle board along with you by having it comfortably rolled up inside the backpack. 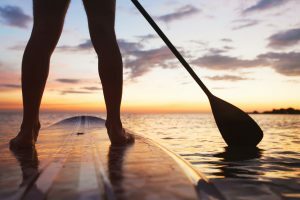 Once you arrive at your destination, you can start inflating it into a full-fledged paddle board. After you’re done for the day, deflate it and roll it up inside the bag. It is that simple, and you can store it in your vehicle with less space required. Although this is inflatable, it can be as sturdy and rigid like the hard boards. Just inflate it until it is solid and firm. You’ll know if it is rigid enough once it reaches 15psi. Its rigidity can also be contributed by its strong PVC materials which are sewn tightly using the Korean dropstitch method. You can keep yourself comfortable despite its restricted surface through its diamond groove traction pad design. This traction pad doesn’t only offer comfort but it also keeps you secure while you’re moving on the board as it keeps your feet from sliding off the surface while you stand up. Some customers noted that the paddle is built cheaply which is why it easily gets broken. The paddle can’t be extended as well which is difficult if you are tall. If you are not content with the quality of the paddle included in this package, you can buy another paddle of your choice. 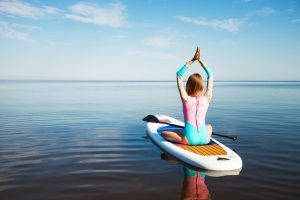 You can also try other brands which offer a better quality paddle, which can be adjustable to fit any height, like the Ten Toes iSUP Inflatable Standup Paddleboard. A few customers reported that inflating this unit is a difficult task because you need to exert much effort in pumping it to its recommended psi. Although deflation is quite easy, inflation takes time and energy. This becomes a hassle if you constantly do it. If you are like those customers who find no pleasure in a manual pump, you can always resort to an electric one. This unit has no repair kit included in its package. 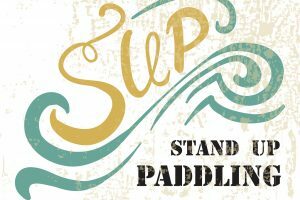 This is a shortfall if you consider the chances of meeting an unprecedented accident that might ruin your paddle board in the end. If you must need a repair kit, you can create your own repair kit or you can consider other brands which offer this accessory, like the Bestway Inflatable Hydro-Force Wave Edge. 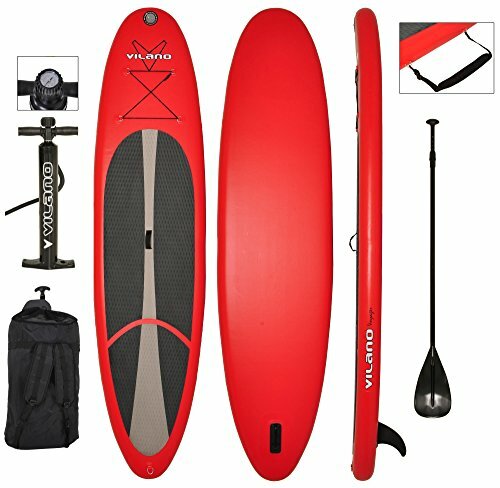 This model is a great paddle board for those beginners to paddling activities. 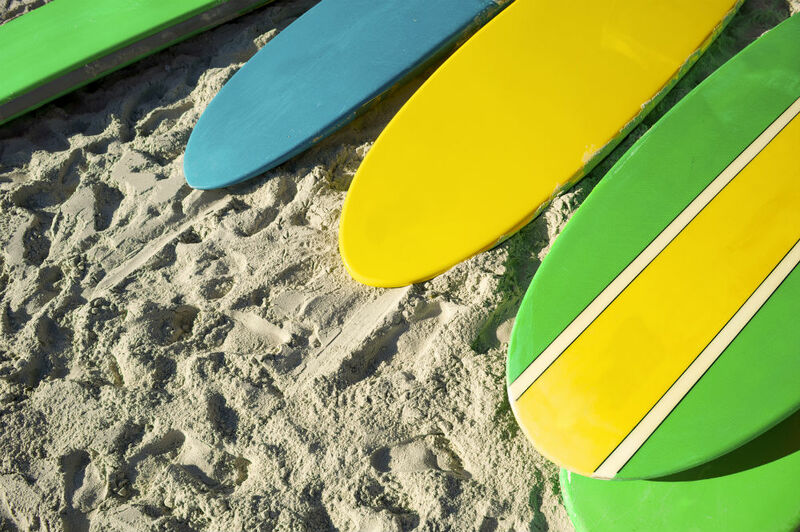 You can rest assured that you get the same sturdiness from a usual hard board as long as you inflate it firmly. 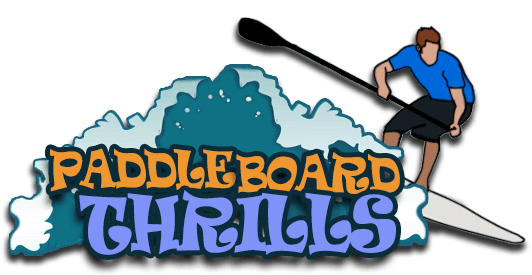 You will also enjoy the portability you don’t usually get from an actual hard board. Enjoy long rides with comfort and ease with this unit. The Vilano Voyager is slightly larger in size as compared to the Bestway Inflatable Hydro-Force Wave Edge. Though both uses dropstitch reinforcement techniques and anti-slip traction pads, the Vilano Voyager can carry more weight as it can take up to 300 pounds, while the Bestway can only carry up to 220. In comparison to the Ten Toes iSUP, the Vilano Voyager is slightly bigger in terms of length and width. However, the Vilano Voyager has no repair kit that its rival offers. Its paddle can’t be adjusted, unlike the Ten Toes which offers more flexibility in paddle length.